We are two families of beekeepers with eight years experience keeping bees on our one and two acre country lots. 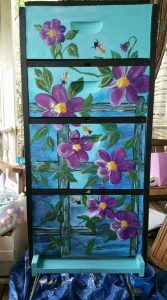 We have been keeping bees in the traditional Langstroth hives, but aging and health issues have made sustaining our practice increasingly difficult due to the physicality of beekeeping. Working in the heat and the standing, bending and lifting have become difficult for some of us. 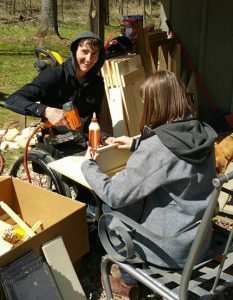 After learning about the way beekeeping is done in Slovenia, with AZ hives mounted in a building and worked on sitting on a stool, and with much better survival rates, we wanted to try this method of beekeeping. However, changing to AZ style hives would be quite costly, at $450 each. 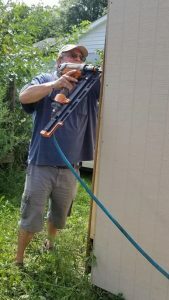 We designed a way to use our existing Langstroth hive components and about $90 of hardware and lumber to make AZ style hives that would be compatible with frames and wax found in the US. We will positively impact the quality of life and livelihood of beekeepers with physical limitations due to health or aging, by modifying Langstroth hives into AZ-style hives, for under $90. These hives make beekeeping tasks easier to perform and less weather dependent, allowing persons with physical limitations to continue beekeeping. Our modification will positively impact the economics of beekeeping by providing a way for beekeepers to use equipment they already have to transition to AZ-style hives instead of purchasing new AZ style hives at $450 each. We will collect data to investigate whether the ease of use of these hives improve colony survival and increase honey production, resulting in a positive economic impact. We will keep inspection records to see if the AZ style hives will change beekeepers’ practices into more ecologically sound management. Our theory is that the Az-style, sheltered hives will increase the frequency of hive inspection and IPM because these tasks will be physically easier and not weather dependent. They can be done inside a cooled or heated structure, with little colony interruption, and less demanding physical labor. Increased care should result in healthier bees with better survival rates, showing a positive ecological impact. The purpose of this grant is to convert Langstroth-style bee hives to AZ-style hives to reduce the physicality of beekeeping for aging and/or handicapped beekeepers. 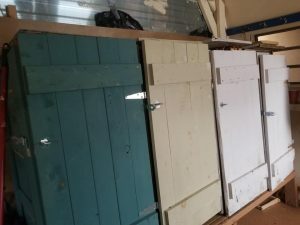 Our belief is that these hives will help people sustain their beekeeping practice without costly alternative equipment and help improve: accessibility; ease of use; frequency of inspections; IPM; colony survival; and honey production. These hives will also open up the beekeeping field to those with physical limitations, as they allow for sitting while working with the bees and eliminate the need for heavy lifting. 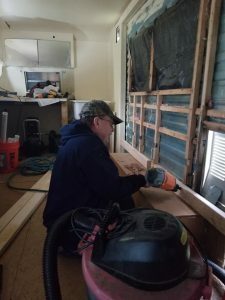 We started working on our SARE Grant project, in March of 2018. 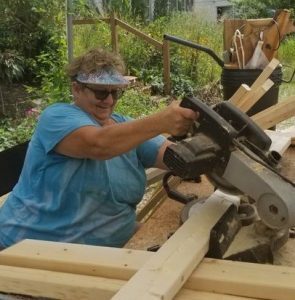 Steve and Jeannie Saum took responsibility for procuring the needed hardware and lumber for building the first 10 LA-AZY (Langstroth Adapted to AZ style) Hives, as well as ordering the new Langstroth parts needed for the hives we would build for our handicapped new beekeeper. 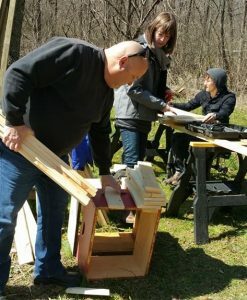 We began building the LA-AZY Hives in April 2018. 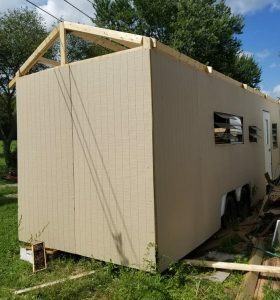 We had hoped to get the modified hives finished, into their shelters and the bees moved over during this past spring-summer-fall bee season, but our schedule and the weather prevented us from reaching this goal. 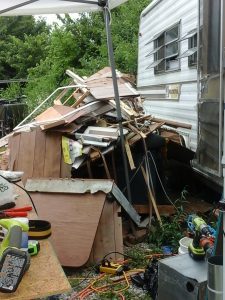 The building of the hives and the shelter took much longer than we expected. 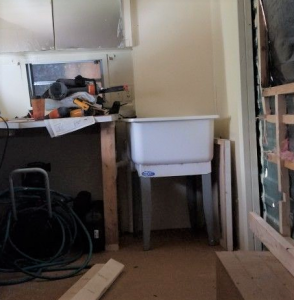 The amount of rainy days we had in late 2018 greatly impacted our work. Also, as we filled the LA-AZY Hives with frames, we realized we had to do some modifications. The frames fit too snuggly and there were places where correct bee space was lacking. We brainstormed some fixes and came up with a plan and the items we needed to modify. This involved taking them apart and adding more spacing with lath in between the boxes. 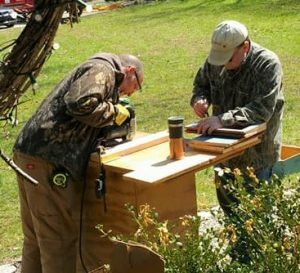 During the fall and winter, October 2018 – February 2019, when weather has permitted, and working around our business schedule, we have almost completed the Saum bee shelter. 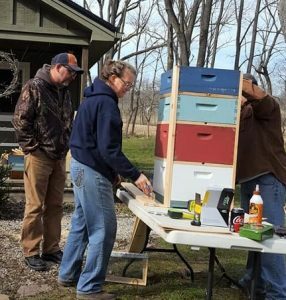 The Dotsons have decide to use an existing building on their property to house the new hives. The Kelletts will either put theirs in a hoop house on their new property or in a small roofed shelter that is yet to be built. The extra time it has taken to build the components we need has put us behind by a season, as we had hoped to have 2 seasons to conduct action research caring for the bees in these new hives by Feb. 2020. We will begin our beekeeping in these new hives this spring of 2019 and will be able to report on this one season. We will want to continue the field research into the spring-summer-fall of 2020 and amend our report after this additional research. 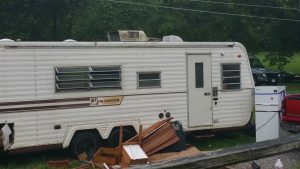 During the months of Feb. – April we will move the honey extractor into the shelter, tow the trailer into place on our property, and add steps into the shelter. We will also modify the other 6 hives for the Dotsons and Kellers. 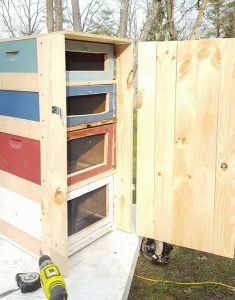 The Dotson hives will be placed in a small garage for shelter this spring, with a tube entrance through the wall. The Kellers’ hives may be placed in a hoop house or we will build a small roof/shelter for them outside. 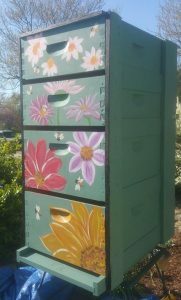 As soon as the weather warms up and the bees break their winter cluster, we will move the bees into the LA-AZY Hives. 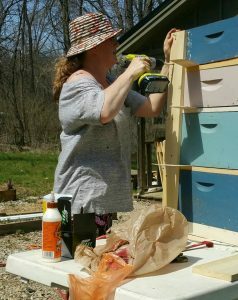 Our plan is to strap the Langstroth hives together after dark and using a dolly, wheel them into the shelter. We will move the frames, one at a time, into the new hives, at night. 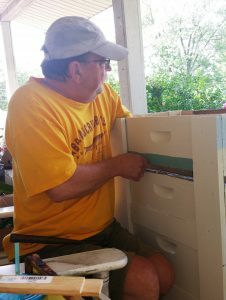 This process will be repeated at the Dotson’s apiary as well. We will get the Keller’s hives started with splits as the season continues. Our plans for the second year of the grant are to document the care and progress of our bee colonies in these newly designed hives, host field days later in the season to share our project with other beekeepers, finalize the hive plans, and publish them in hard copy and online. We will seek places to present our project throughout the beekeeping community, and continue to share our progress on social media platforms. 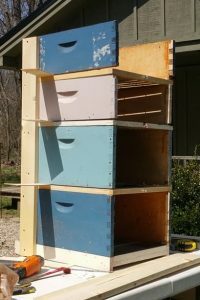 Next fall, at our state conference, we will have a drawing for five “kits” and plans for building these hives. 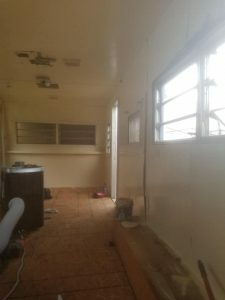 We are documenting our progress on this project at https://www.facebook.com/LAAZYhive/?ref=bookmarks . Raffle off 5 modification kits to beekeepers with physical limitations. adding a lid and hardware closures. 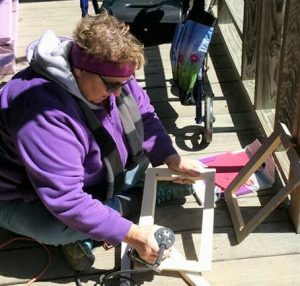 Putting together frames for our new beekeepers and adding them to their boxes. 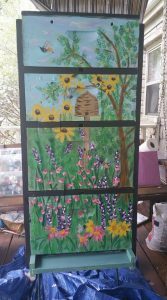 After the hive building process was finished, we met for some painting days. 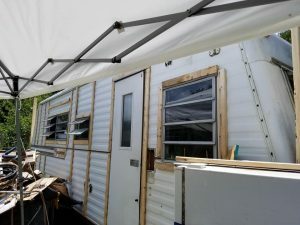 We painted the outside of the hives and door, to seal the wood, using “Oops Paint” (mis-tints). 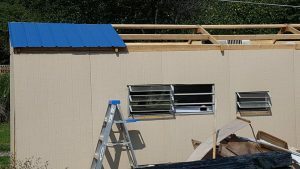 Added a metal roof with overhang that protects the front of the hives mounted in the wall. 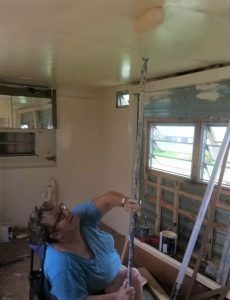 Jeannie Saum cut and painted the trim for the exterior, since she could do these tasks sitting down! 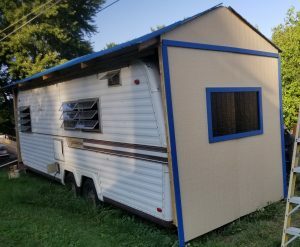 Before the weather turned too cold to work outside, we were able to get the exterior and interior painted and the header beam for the cut-out wall up. lath strips between the hive levels, to correct the bee space. Objectives 3 – 7 will be carried out in the coming year, as we keep bees in our newly designed LA-AZY Hives. Research on this project will start this spring 2019. 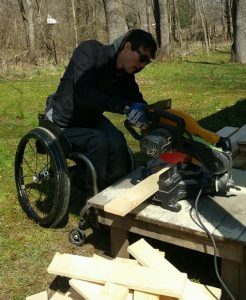 1 We are posting our build process on a Face Book page, https://www.facebook.com/LAAZYhive/?ref=bookmarks. Most of our education and training will come in year 2. 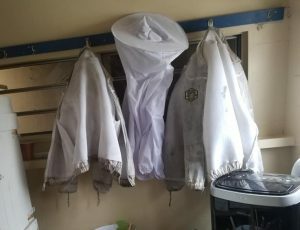 We are still in the build and preparation stage of our project, but share our project and its objectives during any beekeeping activities we participate in. We attend many state beekeeping conferences and local beekeeping clubs to speak and vend our value-added hive products and we always share our SARE project and progress. 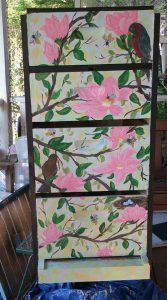 We post online to our LAAZY Hive Beehive Face Book page. 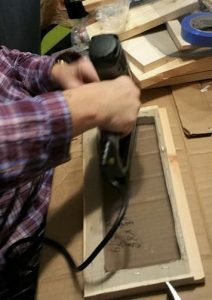 We have conducted many casual tours and demonstrations of our LAAZY Hive prototypes and the hive shelter as it is being retro-fitted. We have had several requests for our plans,which will be release once we do our beekeeping research. We also have included information about our project in some of our Power Point Presentations that we do at beekeeper meetings and conferences. 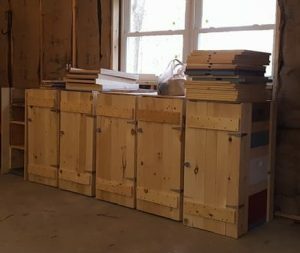 In year two and probably into year 3, we will be posting our bee inspection results on our Face Book page, writing press releases, hosting Field Days to show our beekeeping set up with these hives, publishing our final plans online and in hard copy, and doing presentations at bee clubs. We also will have a drawing for 5 conversion kits to give away at our state conference next fall, Nov. 2019. 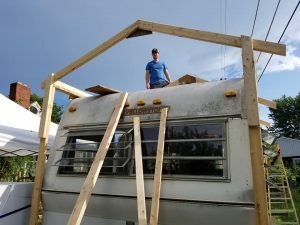 What we have learned so far this first year is that things always take longer than expected and cost more than expected. We will have more to report after we care for our bees in the new hives in year 2. Will have a report on this aspect after year 2.